When Ivaja, a bitcoin startup in Malta, which promises “happy bitcoin ATMs”, started fundraising for their first machine, they were faced with bad press bitcoin was getting after the earlier failed bitcoin experiment. Today the cryptocurrency enthusiasts are optimistic about the emerging bitcoin infrastructure, but admit that the machine, built in the hectic party town of St Julian’s, is mostly for beginners to get comfy with the idea. And yes, Ivaja owns one ATM that can print paper wallets, sell or buy bitcoin from one’s mobile wallet, or half of all such machines in the island. Installed in November, the ATM is approaching "3 digit number of transactions", according to the company that spent c. EUR 6.000 to start the business. Cryptonews.com talked to Leon Siegmund, Ivaja’s co-founder with a background in marketing, who has run various businesses and made documentaries before becoming a blockchain entrepreneur, and Markus Behmann, an online entrepreneur who worked in the financial industry and lives in Malta over seven years. Cryptonews.com: Who would use your machine and how? Marcus Behmann: With the bitcoin ATM there is a lot of freedom that you get back. Currently if you’re on a wage, you get your money directly in your bank account, tax is already deducted, you can spend the money - unless you’re on the BoV, then you can’t (laughs – Bank of Valletta recently banned transactions in cryptocurrencies). However, for every euro you put in a bank, the bank gives your money away as a loan. It’s not like keeping gold in the Middle ages. The money is not there – we saw it with the financial crisis in Greece. Banks had to limit transactions to 200 euros. If you have to pay 2,000 rent, you’re kind of screwed. So bitcoin would have probably never succeeded without the financial crisis of 2008. People were looking for ways to hedge money. The money you have in your wallet is not given to someone else, it’s there. Leon Siegmund: If you’re poor and just earn 5, 8 or 10 euro per hour, it’s much better if you have a deflationary currency. To save in fiat-cash is suicidal because your savings lose value over time. In the 19th century, when we had gold, people simply saved in gold and it worked. With bitcoin saving works again, and you don’t have to understand stocks, saving plans, you don’t need to invest like a businessman – if you save in bitcoin your money goes up in value. I believe that everybody should have bitcoins, no matter how old, no matter what background, no matter what education level. CN: What is the transaction fee? MB: If you buy it, it’s 10%. CN: Let’s say, I want to use this now for sushi, as the machine is housed by a sushi restaurant, Gochi. LS: No, you shouldn’t buy your sushi with bitcoin. You should keep your bitcoins and give away the euros. But at one point it will switch – when there are no euros anymore, people will buy with bitcoin. And actually the bitcoin is at the moment not very useful, because there are very high transaction fees, it’s the biggest currency and it’s overloaded. Litecoin is much better. For purchases you’d need a mobile wallet – there are many services for that. CN: Given that at the moment there are so few places where you can use bitcoin, what is the market competition in Malta? LS: There is only low competition, but it's starting to grow. But [the market] will be so huge in the future, that nobody really cares and actually most crypto-entrepreneurs are very open minded, like to cooperate and share ideas. MB: The ATM industry is small compared to the big online exchanges. Most bitcoin businesses are operating online. That's why we have a niche with the machine. If you are familiar with bitcoin, why would you go to an ATM with cash and withdraw it if you can do it on your mobile phone? LS: The machine has a very specific audience. MB: It’s for people who are beginners or who don’t grasp the concept of bitcoin, or who just want to have some tangible stuff, like a paper wallet. The machine is something familiar for many people. CN: Currently it takes a lot of commitment to use this service as opposed to fiat-currency. LS: Bitcoin is today like internet was in 1989. So there is a way to go until we have very easy products. But the good thing is, it’s not one internet or ‘the Internet’, everybody can host or create a website or offer an email service. When internet came, people were saying, yeah, but with the internet, people will use it for criminal activities. Sure, there are some criminals in it, but 99% of the people are just normal people who share pictures of their families and their cats. Very likely in a few years bitcoin wallet services will be as smooth as your iPhone operating system or your email. Nobody understands how email works, but everybody uses it. The technology is already quite cool, but there will probably be more advanced coins, more infrastructure, and easier for a normal human being to understand the services. Besides, money works even if it’s a bit difficult to exchange, because it’s a store of value in the first place. Bitcoin is a great store of value, because it’s limited to 21 million. If people really want to understand bitcoin, there is no way around than the so-called Austrian school of economics, which is the only school which really clearly analyses how the world really works. The economy is simply people making transactions on a voluntary basis. A good example is the phone industry - no industry is more disruptive, more innovative and more price-deflationary. CN: And yet your phone is designed to go into the dumpster in 2-3 years. LS: You’re talking about planned obsolescence – this is a result of inflation, where you always have to produce more and more. If you have deflation – like bitcoin – then this phone could be designed to last a lifetime. CN: The first attempt at bitcoin ATM in Malta failed. How did this affect your business? LS: We have to be very clear – the guy is a criminal, and he just stole money. It’s very important that criminals are prosecuted. CN: Was he a member of Malta’s bitcoin communities? LS: No, I called him once, - my life philosophy is that I give everyone a chance, I want to be a fair person. But it turned out that the bad omen and things [said about him] were true. But we shouldn't take the wrong conclusions out of this. It's only a minority of black sheep who are responsible for the bad news. Personally I've only met very qualified and bright people in the blockchain industry who are all very integer and who keep very high standards. I think in a few years consumers will be better protected and those sort of scams will be history. CN: How many machines are you planning to install in Malta? LS: We’re not the only ones. 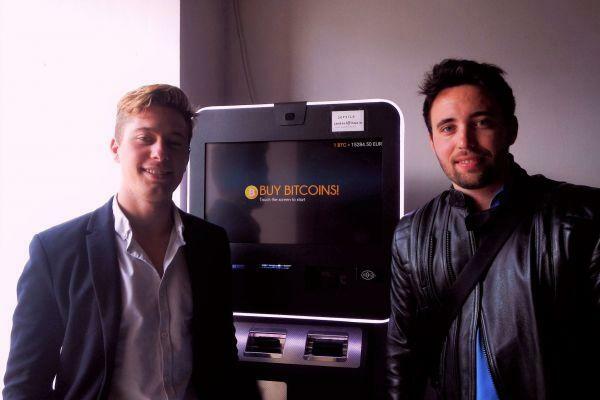 There’s one machine in Zanzi Homes – a rental agency that accepts bitcoin. At the moment I believe it’s really experimental. We have to see how people react, if they like it. So we’re in that phase of starting with one machine and building up the market together with other people, and then we can make Malta a bitcoin island.